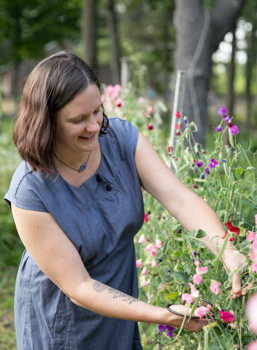 Have you met our puppet peeps? It's quite possible that I've posted them before, but a quick search by me turned up nothing. So I figured if I can't find them on my own site, then probably no one else has either, if they're even here. So let me introduce them to you. From left to right, we have: The Princess, The Sorceress, Josef, The Farmer, The Captain, and The Song and DanceMan (who's round rim glasses have gone missing). 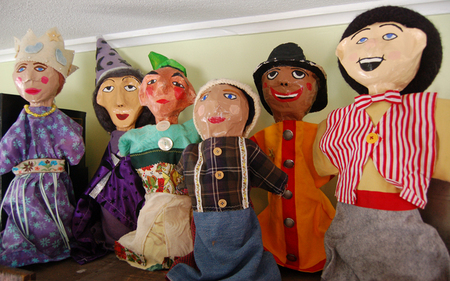 Josef was our first - made by local artist and puppeteer Nance Parker. Inspired by that one, I made the rest a few years ago. Ezra was just a babe at the time, and when he napped, Calvin would dream up these characters and we'd both go to work making them. Being a lover of the details (even at 3 years old) he loved the process of making these puppets almost as much as I did. They were quite time-consuming, especially considering how 'folk' and simple they are in style, but I remember being nearly consumed by each one until it was finished. 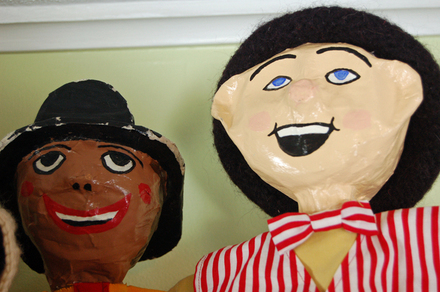 The heads are all papier mache - we used a variety of trial and error paper/paste combinations, and techniques, which got more elaborate and improved with each one (The Farmer was our first, and Song and DanceMan our last). Once the face shape was complete, the 'dressing' of the puppets was enormous fun with both knitting and sewing, as was painting on the faces (I used gesso, then gauche, and then a sealant). The process was great fun for me in that it was a little bit of a lot of different mediums - perfect for my crafty short attention span with not a ton of skill in any one area. For a while after making them, I kept them in a basket on the floor amidst all the other toys. I wanted to be all cool and chill with them being played with, dragged around, stuffed under the couch, and eventually trashed by the kids. But, um, I wasn't cool. I got a little attached to them. They're my toys too, you know. 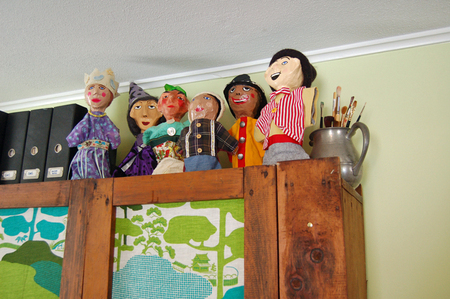 And so now they sit here atop our craft cabinet - safe from the random stepping-on, but always in sight, and always at hand for a puppet show whenever anyone gets the urge. Our puppet peeps have told many a story in the past few years through the minds and voices of my littles, and I think they have many more to tell. And I also think they're ready for a few new characters to join the troupe. We're working on it - there's a fierce debate around here between King Arthur as a boy, and Agustus Gloop. Together, I think they could make for quite the interesting puppet show.